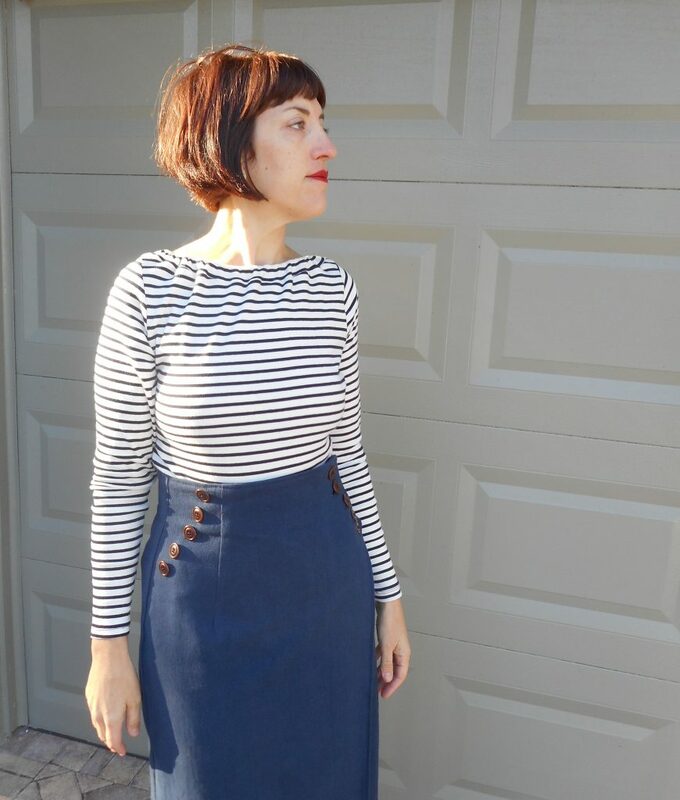 Here are my first makes for the New Year- a nautical inspired tweed wrap skirt V9209 with a Breton stripe knit top! I feel so elegant and chic! 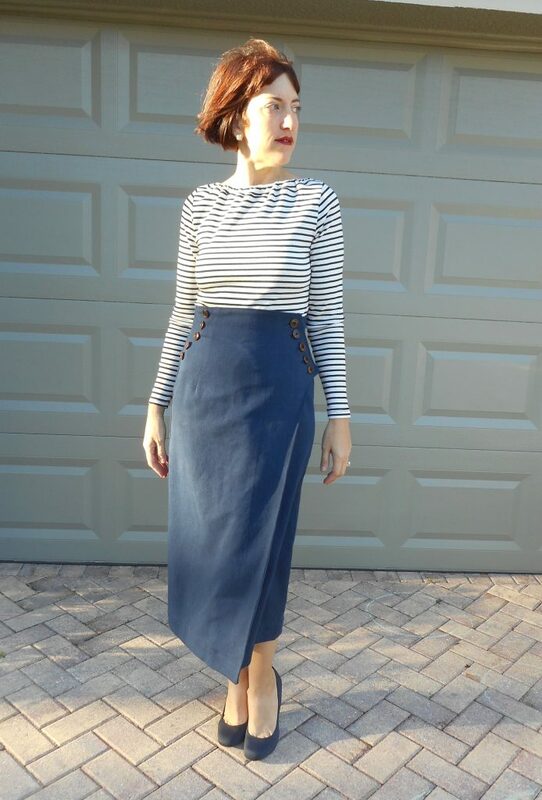 Nautical looks are on trend this season which makes this perfect for my work wardrobe. 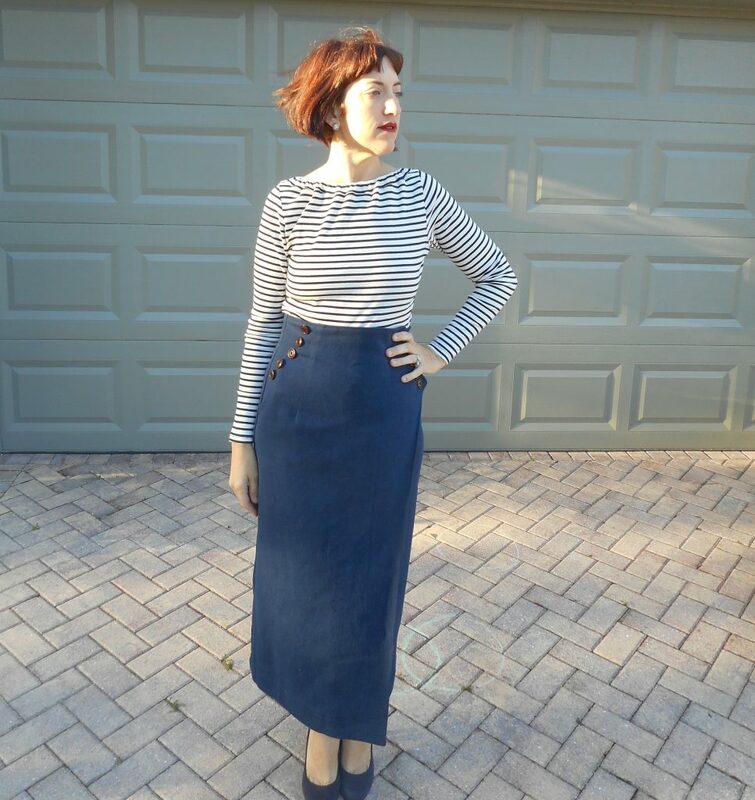 I’ve been dying to try out this Vogue pattern midi wrap skirt with its button detail for a few months now. 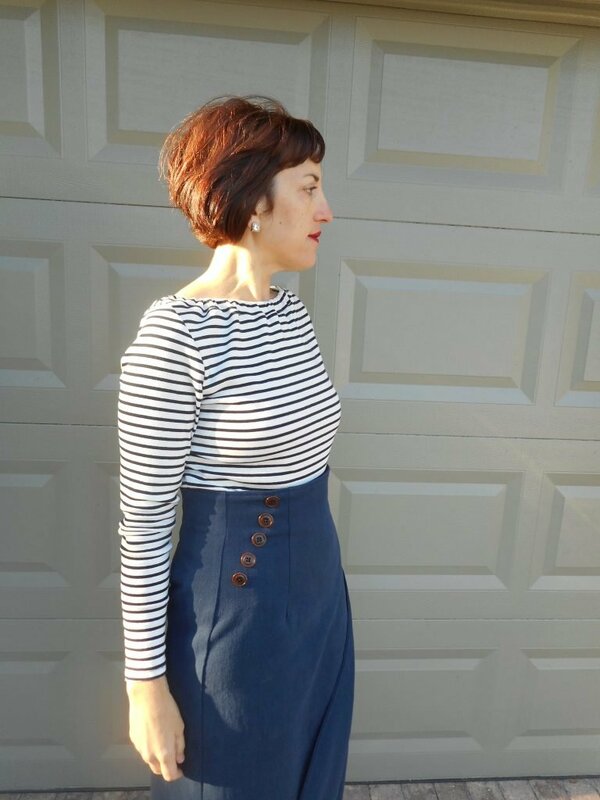 I love the highwaist, button closure plus faux button and the interesting angle of the wrap. So versatile- I can dress it up with heels or wear it with my converse to work. Organic Cottons Plus contacted me in December to do another review for them. You can see my earlier reviews here , here and here. 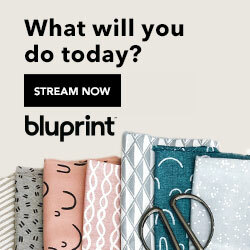 Perfect timing as I had just ordered a bunch of swatches and knew exactly what fabrics I wanted! I always try to go for something new that I haven’t sewn with before when I do these reviews. I fell in love with this Navy Hemp/Cotton/Wool mix tweed when I was looking for something for a Chanel style jacket. The weave was a bit too subtle for that project but perfect for this. 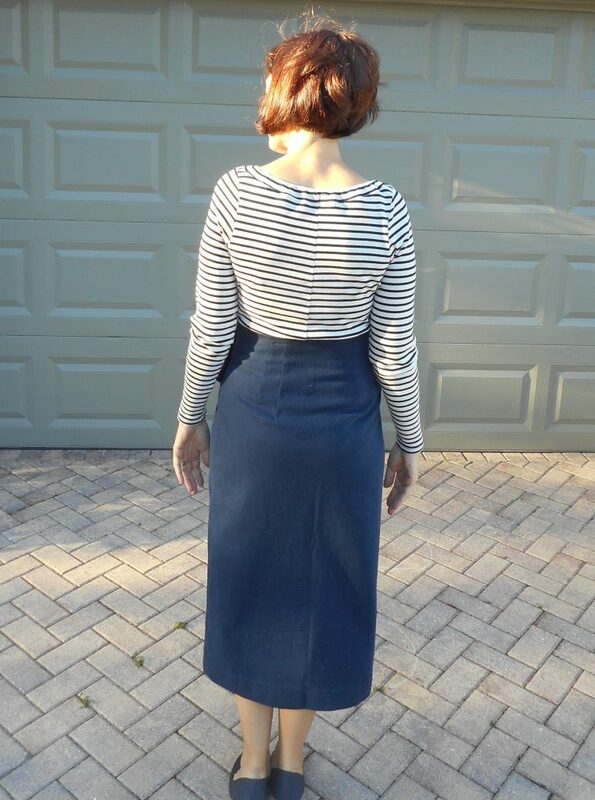 I paired it with the Navy and Cream stripe in a rip knit for the long sleeve top. Love it! Please note this post contains an affiliate link. I’m a preferred blogger for Organic Cottons Plus and received the fabrics and notions for this project at no cost in exchange for a fair and honest review. 12 used- available in packs of five in a small and large size. 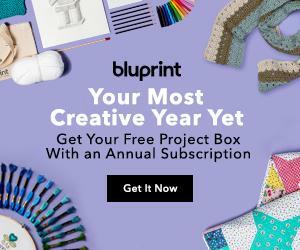 This color is currently in production, but there are a variety of other colors currently available. Eco dyed,GOTS certified 100% organic cotton multi-purpose thread. 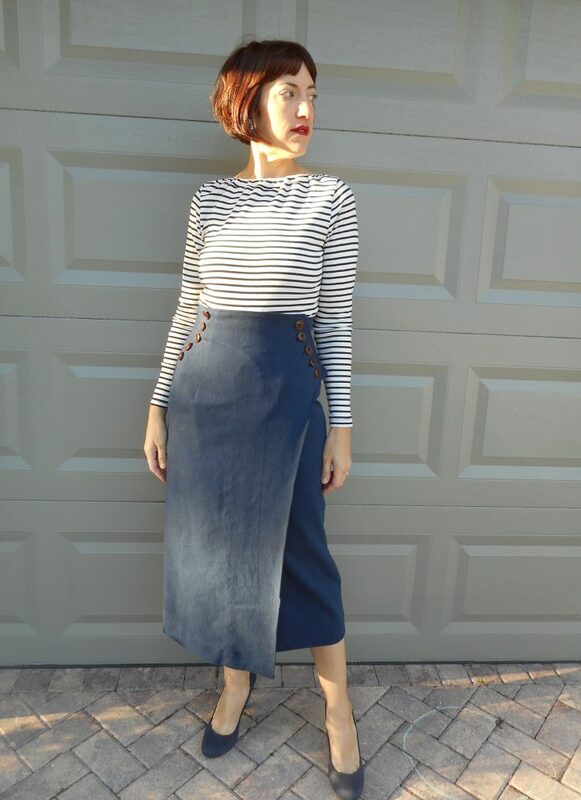 The skirt was a pretty easy sew. I made this in a straight size 12 and the fit is spot on. I almost always make a 12 in Vogue patterns even if the measurements put me in a 14. 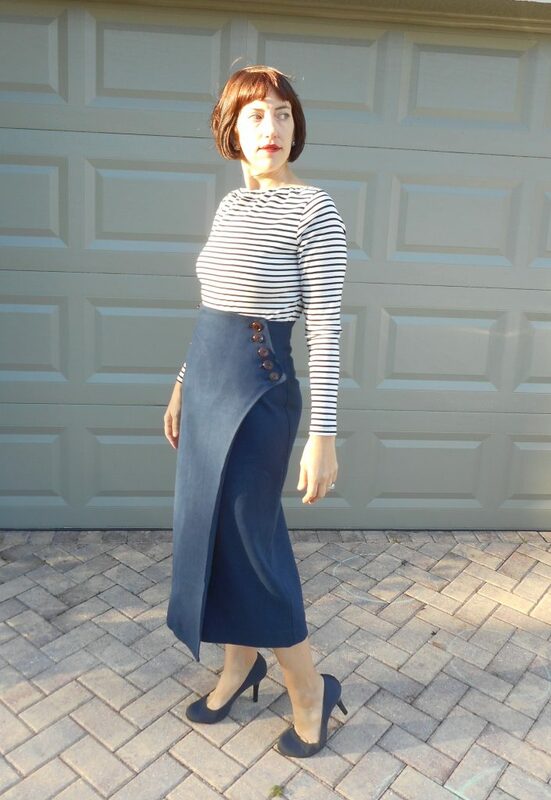 I made the longest version of the skirt, View C. It also has variations for a mini and knee-length version. The design has an interior facing (I used my main fabric and did not add interfacing) and three main sections to the skirt so it went together quite quickly. The back section has double darts on each side which gives a beautiful fit. The front and back wrap sections have single darts and angled closures. The front buttons on the left side are faux to mirror the closure and then the interior has two buttons to keep it secure. The trickiest part for me was getting the buttonholes perfect as the thicker texture doesn’t make my machine happy. Plus I tried to be careful not to leave press marks from the facing. The fabric steams really well and is a nice solid weave with a bit of texture that resembles a boucle but is a bit flatter. I love the subtle texture. The only change I’ll make to this pattern is to do a full or bagged lining. I don’t like how the facing tends to want to hang away when walking. I’ll probably add a lining to this eventually. For the blouse I wanted a wider neckline and used my knit sloper to make a long sleeve top. I didn’t take into account how stretchy the rib was so I needed to make the body more fitted. Next time I’ll know to reduce the ease further when working with a rib knit. I added in a back seam to improve the fit and did my best to keep my stripes lined up. My stripes do line up almost perfectly on the sleeves! I was still having a bit of gaping at the neck so I added an elastic to the neckband and I really love how it turned out. Great save! It adds a bit of a feminine touch with the slight gathers. I love how soft this fabric is. It’s really cozy and keeps its shape well all day. Plus the color is wonderful. The cream is rich and warm and looks so much better on me than a pure white does. I had just enough left over from my skirt to make my dad a tie for Christmas! I’ll share some pics soon but it turned out so gorgeous! The tweed is subtle but elegant and makes for a lovely simple design. It was freezing and windy the morning I took these pics while we were visiting my mom last weekend-47°! That’s so cold for Florida! But perfect weather for me to take advantage of this cozy look! It’s already warmed back up to the 70’s thank goodness. Hope you’re all enjoying the new year-Happy Sewing! I love that skirt! The high waist looks great on you! What a beautiful outfit! That skirt is so elegant and beautiful teamed with the breton stripes. Very elegant! 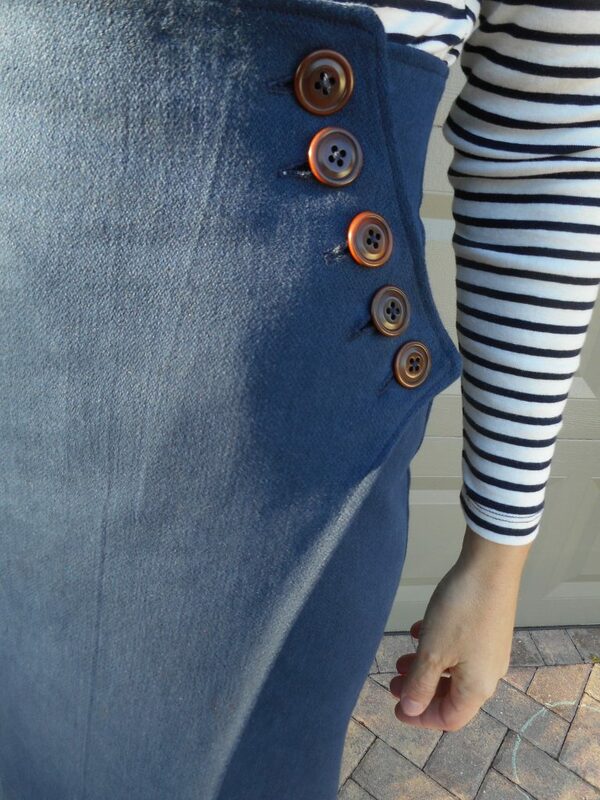 The buttons really accentuate the style lines of the skirt. Also, those shoes are a perfect match! Thanks Bea! I really love this pattern. Those shoes were a lucky find! They work with everything. What a stunning skirt! I love the shape of the wrap piece and the buttons on both sides. Great job. Thanks Gosia! I love midi skirts! The pattern does offer two alternate lengths, above and at the knee, making it really versatile. 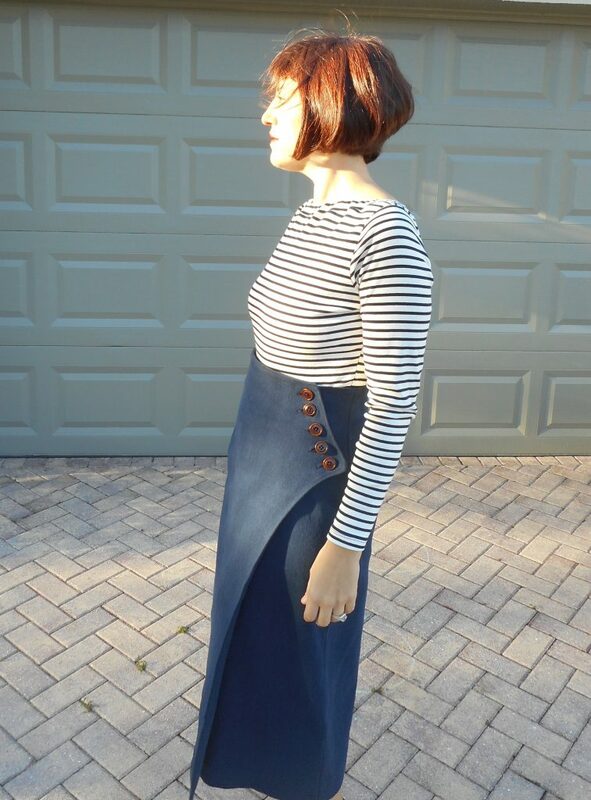 This skirt & Breton top combo looks fabulous. Love your choice of buttons too. I have stayed away from wrap style slim fit skirts – I worry that that they will be a little too daring when I sit down or walk. So how practical is it to wear this skirt? Thanks so much! This skirt gives full coverage. The wrap is substantial so its not an issue. Plus its not too narrow at the hem so its easy to get a full stride when walking. looove the entire outfit but the skirt is oh so good … I would wear it in a jiffy … brilliant fabric choice! Thanks! I’m wearing the skirt right now! It’s so comfy but still elegant.